Whoosh – that was the sound of time hurtling by. My Scottish travel blog is two years old today! It seems like no time at all since I started sharing my Scottish travels, and my beloved wee white dug with you all. They’ve been an incredible, whirlwind two years too. At times this blogging/social media malarkey has felt surreal. My boy has fans – actual fans! People who love following him on his adventures around Scotland. Fans, who’ve welcomed him ‘virtually’ into their lives and hearts. This blog, and subsequent spin-off feeds on Facebook, Twitter and Instagram have shown me the nice side of the internet. 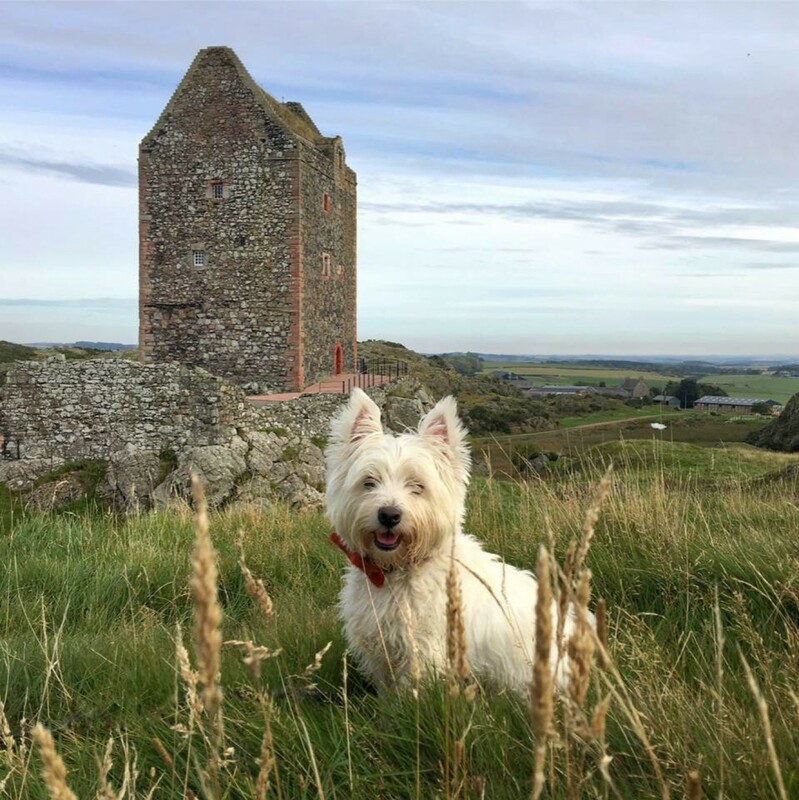 To me ‘Scotland with the Wee White Dug’ is more than just a blog, or social media page. It’s a cyber community. So, in true Scottish fashion as Hogmanay draws near, I’m going to celebrate my ‘blogversary’ by looking back at some of my favourite moments of 2017. 2017 got off to a great start on the lovely Isle of Mull. January 1st was a crisp, bright day. We spent it outdoors with the boy, wandering in our favourite place. I’d gladly take 365 cold, clear January days in a year, over dreich greyness. When I think of my calmest moments of 2017, two memories spring to mind. In the first Mr G and I are relaxing in a hot tub at Arran’s fabulous Auchrannie Resort. It was a cold, February evening and the moon was shining bright overhead. The sky twinkled with stars, and I felt totally at peace. As I lay soaking, my mind wandered to the island’s Neolithic past, and the people who erected the giant standing stones on Machrie Moor. Once upon a time they’d have looked up at that very same moon. I felt connected to my ancient ancestors that night – knowing that we’d both gazed skywards and felt the magic. The other occasion I remember experiencing a feeling of calm, was at the Italian Chapel on Orkney. It was March and we visited with the Wee White Dug, taking it in turns to go inside. I’m not religious, so I was surprised by how the place made me feel. Stepping inside the tiny chapel built by Italian POWs during WWII was incredibly moving. It was humbling to think that POWs could have created such a thing of beauty during a bloody war. And even more staggering when you consider that the building materials were provided by ‘the enemy’. To me, that highlighted the best of humanity. The Wee White Dug isn’t the only bonnie creature to inhabit this land of lochs and mountains. I love encountering native wildlife on my travels, although it often eludes me and my camera. In February we met a majestic stag on Arran. He was the finest we’ve ever seen, and I was captivated by the handsome beast. We watched him respectfully from a safe distance. It was such a privilege. With May came seafaring adventures and seabirds galore. The boy took to the sea to visit the Gannet colony on Bass Rock with his friends from the Scottish Seabird Centre. The rock, sky above it, and sea around it were teeming with 150,000 Gannets – it was such an impressive sight. That same month, Mr G and I enjoyed a rare dug free day out to visit the clowns of the sea on the Isle of May. The 80,000+ Puffins on the island were an utter joy to watch. Seeing them made the choppy boat crossing to the island totally worth it. Puffins have the ability to make you feel incredibly happy. Every year needs a dose of adrenaline inducing fun. This year’s excitement came in the form of a water-based adventure. On a perfect, blue sky summer’s day we tried cable wakeboarding at Foxlake Adventures in East Lothian. I loved it, and just this once I was better than Mr G at something sporty. His pride took a bashing but you can’t always be the best at everything – so, go me! Mr G was back on a winning foot when I wimped out of Foxlake’s rope based assault course over water, leaving him and The Teen to complete it. I did the zip-line at the end of the course though, as despite not being a fan of even modest heights, I’m a big fan of zip-lines! As we splashed around in the water, the boy watched from dry land, looking bemused. Where’s the Wee White Dug?! 2017 hasn’t just been about Scottish travel. We’ve enjoyed some overseas adventures too. June saw us jet-off to NYC for the second year in a row. This time, to celebrate The Teen’s 18th birthday. It was a brilliant trip from start to finish, and we packed loads in. A stand-out moment for me was FINALLY getting to see the Yankees play at Yankee stadium. It’s been on my bucket list since I was a teenager. Waaaaay before bucket lists were even a thing. The Teen turned out to be a bit of a Yankees fan too, much to Mr G’s disgust. He’s a Mets man all the way. It was fun showing The Teen around the crazy city we’d fallen in love with 12 months earlier. There were so many highlights packed into our trip, but it ended on a high for all three of us with a hyper-reality Ghostbusters experience. Kitted-out with proton blasters, virtual reality helmets and computerised vests we were transformed into ‘virtual’ Ghostbusters. We nervously crept around a hyper-reality landscape, blasting ghosts as if our lives depended on it – and at the time it felt as if they did. I’ll never forget the feeling of pulling down my VR visor to see myself transform into a video game avatar – bizarre. And the sugary, sweet smell of a burning Mr Staypuft – unreal! in October Mr G and I visited Iceland and were bowled-over by the land of fire and ice. From spouting geysers and thundering waterfalls to thermal springs, it was an awe-inspiring trip. The fact that over 50% of Icelanders believe in the existence of elves made me love the place even more. And how could I forget the Northern Lights?! On our first night in Reykjavik we watched them dance from our hotel room balcony. They were so bright that we even managed to snap them using our iPhone cameras. In November there was a short visit to Amsterdam. A city with a distinct aroma and a very different side to it after nightfall. It was a fascinating place full of higgledy-piggledy buildings, and being billiard table flat it was perfect for walking in. We clocked up miles on foot, so the chocolate slathered churros we developed a taste for were soon walked off – at least, that’s what we told ourselves! There are parts of Scotland that are very popular with tourists, and others which are often (wrongly) overlooked. This year I’ve been lucky enough to spend time in two under appreciated places that I love – Aberdeenshire and Morvern. Aberdeenshire has it all – beautiful beaches, impressive castles and pretty villages. In fact some of Scotland’s finest beaches, villages and castles can be found in the region. Yet, tourists often flock elsewhere looking for an interpretation of Scotland they’ve been force-fed from a holiday brochure. If you’re looking to experience remote, beauty in Scotland, Morvern is perfect. We stayed on the Ardtornish Estate in October and November and had experiences there that we’ll always remember. We watched eagles soar, otters hunt and listened to stags rutting in the night. We rambled freely, surrounded by the most stunning scenery, and we felt blissfully happy. Breakfast is my favourite meal of the day, especially when travelling. I love the anticipation of the day ahead, and chatting over coffee. It’ll take some beating to improve on the feast of a breakfast we had in August, at the amazing Edencoille B&B in Grantown-on-Spey. Our table was spread with a whole array of treats – fresh fruits, breads, pastries, granola, honey, jam, homemade yoghurt, coffee, fruit juices and that was just for starters. Our main course was a perfectly, cooked Scottish breakfast!!! As we tucked into our banquet, we watched a red squirrel outside enjoying breakfast too. In July we had one of the best meals we’ve ever eaten, when we stayed at the Four Seasons Hotel in St Fillans. Our gastronomic extravaganza kicked-off with some delicious canapés which gave a hint of the mouth-watering delights to follow. Our starter of poached free range hen’s egg, new season asparagus, parmesan, and truffle butter sauce was divine. Next, a palate cleansing sorbet for me, and demi tasse of Chef’s soup for Mr G – he raved about it for weeks afterwards. Our main course was roasted corn fed chicken, potato fondant, leek fondue and braised salsify in a tarragon jus. It was full of flavour, and unbelievable good. Dessert was a date sponge with rice pudding ice cream, salted caramel sauce and orange tuille for Mr G (devoured in seconds) and Perthshire strawberry soup, with vanilla panna cotta, strawberry compote and pink peppercorn tuille for me – utterly delightful. To experience 5 star dining at a 3 star hotel was an expected but very welcome surprise. Things didn’t slow down any in December as Christmas approached. The month began with a visit to Edinburgh Zoo to see the Giant Lanterns of China with my blogger buddy Mel from ‘Full Stop Next Chapter’. The lanterns totally wowed us and we snapped photos like a pair of frenzied paparazzi. My favourite was a replica of Beijing’s Temple of Light. It was a close run thing though – pandas, penguins, chimpanzees, chameleons, dragons and delicate flowers – they were all captivating. Mid-month we managed to squeeze in a trip to Inveraray – the beautiful Argyll town we fell in love with shortly after we met. A return visit to the legendary George Hotel was a definite 2017 highlight. If he could speak, the boy would tell you that rolling in the snow at Rest and be Thankful was his memorable moment this year. Two nights before Christmas Mr G and I enjoyed a date night in town. Edinburgh’s Christmas brings a whole array of festive entertainment to the city, but it was the Ice Adventure – A Journey through frozen Scotland that captured my attention. Knowing it would be -10 inside we kicked-off our the evening with spicy curry and whisky based cocktails, before heading to George Street to view the icy, interpretation of Scotland. Inside, our breath billowed like smoke in the freezing air, but we didn’t care about the cold – the ice sculptures were stunning. It was like stepping into the magical, dream-like World of Edward Scissorhands. We met Viking warriors, mythical creatures and ancient royalty, all intricately sculpted in ice. They were hauntingly beautiful – glistening, white. I’ve always been drawn to the icy, stillness of winter. Mr G was obviously impressed by my choice of festive entertainment as he snapped photos like a man possessed. Best of all was Greyfriars Bobby – Edinburgh’s other braw wee dug. Forever associated with a heart-warming tale of loyalty from Edinburgh’s past, his likeness now captured perfect in ice. And there you have it. Some of my most memorable moments of the year. There are many more I’d love to have shared, like our stay at the historic Ice House by St Cyrus Beach, a summer sail to Inchcolm Island on board Maid of the Forth, the breathtaking beauty of the Uists, or surprisingly falling in love with hostelling after a stay at the SYHA’s Torridon hostel. However, I can’t keep you here all day so I’ll stop waffling! If you’ve enjoyed journeying with me over the past couple of years, buckle-up. 2018 will soon be here, and we’ll be embarking on another fabulous, 12 month tour of Scotland. And, to those of you who’ve kindly invited me to eat, sleep and experience all that Scotland has to offer this year – thank you. You’ve enabled me to see and do so much, and given me lots to write about here on my wee Scottish travel blog! We are from Australia and are looking forward to touring Scotland in September. Your blog is a fantastic way to discover it’s hidden secrets. I love that you seem to be foodies, enjoying different cuisines. It all looks so delicious. And Casper, what a gorgeous boy he is! Pingback: My Scotland blog is one today. Looking back on 2016 and my first whirlwind year as a Scottish travel blogger. First, I have to say how much I look forward to your blog entries! Thank you, so glad you enjoy the blog. Those portraits are gorgeous. She’s very talented. It’s funny when you see it written down in a (condensed) post and you realise how much you manage to squeeze in to 12 months. And make time for work too! Lovely post and thanks for the mention at the end. My great memories of Scotland relive thanks to you and the wee white dug! Happy New Year to both of you from Italy! Brilliant! I love reading your blog, not just the entertaining stories and comments from the boy himself 😀, but I know it will be a great resource for places to stay and eat on visits north. Your descriptions are so vivid and your photos are beautiful. Step aside more well-known travel sites, this is my go-to source of information for touring the homeland. Thank you and a guid Hogmanay! Marvelous recap! Have an even more awesome 2018…if that’s possible! Happy new year to you. Your blog always makes me a tad homesick. Thankfully 2018 will see me coming back for a brief trip. Looking forward to your posts from your upcoming Scottish adventures. Beautifully done, as always Sam! Looking forward to another year of fine adventures with you, Mr G, and of course the star – Casper!! Samantha…I can’t tell you how happy I was I followed your adventures from the Westie Nation site! Seeing Scotland is on my Bucket List and you whet my appetite with each of your wonderful blog posts. I LOVE that you include the food as well as the sights as it is right up on the top of my list. The Wee White Dug is fabulous! Thank you and can’t wait to see what 2018 holds. Happy New Year from Oregon, USA. Hi Lucille – I’m so happy to hear that you enjoy the blog. Food is a huge part of our travels as it fuels our adventures so it’ll always make an appearance in the blog. Our diary for 2018 is already starting to fill up so expect lots of new Scottish road-trips. Have a wonderful New Year when it comes. A lovely review of your year. Happy New Year ! Thank you for sharing your adventures over the last twelve months. Always look forward to reading about where your travels have taken you, both in our wonderful country and farther afield. And of course, it just wouldn’t be the same without the wee white dog. Scotland was always on my bucket list,but I probably won’t get there now,so seeing it with you and the wee dug is the next very best thing-thank-you and Happy New Year. Wow, what an exciting year for you and your family Sam. How do you fit it all in?! The Italian Chapel is so beautiful, loved the video clip. Isle of May just might be on my list next year as I’ve never seen puffins before. I’d also love to stay at the Auchrannie, I’ve never been as we are usually day triping or camping. Reading about the hot tub looking up at the stars really gave me goosebumps! I must experience this. Awww thank you Dawn-Marie what a lovely message. You definitely need to pay the Isle of May a visit. It’s a fab day out and the puffins are adorable. There’s also the brilliant chip shop in Anstruther to enjoy once you’re back in dry land. Love your blog and the wee dug, Samantha. Happy New Year from Canada!